Toshiba Expands e-STUDIO Monochrome Line for Small-to-Medium Size Businesses | Industry Analysts, Inc.
IRVINE, Calif. (September 30, 2015) —Toshiba America Business Solutions, Inc. today unveils its newly-minted monochrome multifunction products (MFPs), the e-STUDIO™2309A and e-STUDIO™2809A. The latest additions to the Irvine, Calif. company’s industry-acclaimed e-STUDIO monochrome line enable small-to-medium size business (SMB) owners to affordably manage their printing, copying, scanning and faxing needs. Touting an array of standard and optional features within a rugged and compact chassis, Toshiba’s ledger-size MFPs complete most any print job, large or small. With a 2,400 x 600 dpi resolution and up to 28 letter-size pages-per-minute (ppm) output, the e-STUDIO2309A and e-STUDIO2809A deliver crisp and clear text at a rate professionals can appreciate. For businesses seeking to conserve paper while optimizing document space, the print devices incorporate an automatic duplex unit for seamless two-sided printing. 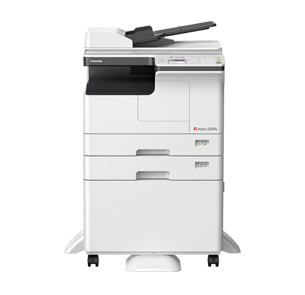 Both models scan color documents at up to 22 ppm for electronically delivering vibrantly-hued materials. Combining an accelerated 18-second warm-up time and first-copy-out time of less than seven seconds, Toshiba’s two MFPs are capable of quickly producing output. A standard 350-sheet capacity – with room for 1,700 sheets by adding more paper drawers – makes the products’ suitable for virtually any office environment. To complement its standard network connectivity, the e-STUDIO MFPs feature optional 802.11 B/G/N support to operate within any wireless environment. On-the-go employees carrying mobile devices from meeting-to-meeting will welcome the e-BRIDGE™ Print & Capture mobile app enabling users of Apple® iOS and Android™ devices to wirelessly scan from and print to Toshiba’s MFPs. The company’s e-STUDIO models also support the company’s resolve to soften environmental impact while meeting the stringent Restriction of Hazardous Substances directive – or RoHS – compliance. Toshiba’s MFPs additionally address the U.S. Department of Energy’s and U.S. Environmental Protection Agency’s energy efficiency standard and are also ENERGY STAR® awarded. The e-STUDIO2309A and e-STUDIO2809A are available through authorized Toshiba dealers for prices starting at $2,595 and $2,995. For more information about Toshiba products, or to locate an authorized Toshiba dealer in your area, visit www.business.toshiba.com. Irvine, Calif.-based Toshiba America Business Solutions (“TABS”) is an independent operating company of Toshiba Corporation, a Fortune Global 500 company and the world’s eighth-largest integrated electronics manufacturer. TABS provides printing, scanning and copying solutions, managed document services and digital signage for businesses of all sizes. This entry was posted in Toshiba and tagged copiers, e-BRIDGE, e-STUDIO MFPs, e-STUDIO2309A, e-STUDIO2809A, ENERGY STAR, MFPs, toshiba by andyslawetsky. Bookmark the permalink.